At Devine Baseball we offer the best value and equipment for indoor baseball and softball training. Whether for recreation or your team needs a one time practice space before a tournament or even if you prefer to set up a weekly recurring reservation, we will set up something to meet and exceed your needs. Our batting cages can be utilized to improve hitting technique and fundamentals with tees or flip toss. Batting cages can also be used for live batting practice where coaches, parents or instructors throw from behind “L screens”. In addition, our batting cages are not limited to just hitting. Batting cages can also be used for instruction on fielding, throwing, pitching, catching, arm strengthening, and other areas of training. Please keep in mind that Devine Baseball promotes safety throughout the facility. We ask that all individuals practice safe conduct for not only themselves, but for others, while utilizing the batting cages. Additional info : The favorite of Major League Teams. This hopper-fed “arm style” machine simulates a true overhand pitcher. This machine enforces proper timing to know when to start your swing and when to shift your weight. 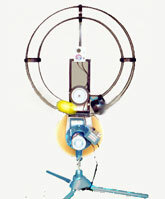 With each pitch you see the machine’s arm wind up and release the ball. Additional Info : The official softball machine of the ASA and USA softball teams. This superior softball training aid allows you to hit 12 in softballs. With the J-Mo attachment this machine features real fastpitch motion and tempo improving hitter load, stride and launch mechanics. The softball machine features a digital readout display, so you can set your machine to throw the exact mph you desire. Additional Info : The JUGS Jr. 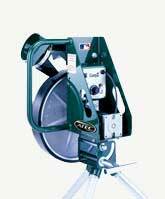 Pitching Machine is the most widely used youth-league pitching machine in the world. With a digital readout display you can set your JUGS Jr. to throw at the exact mph you desire-you decide which speed is best for your players. This machine patents the “always see the ball” delivery system. 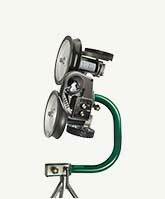 Additional Info : This machine throws consistent strikes for your players can confidently step into the batters’ box and start swinging, since they know each and every pitch is going to be a strike. Additional Info : Variable speed control for delivering accurate pitches. 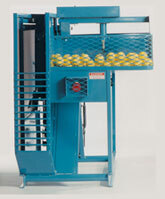 This machine throws a variety of breaking balls-drop ball, curve and change ups. 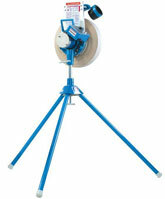 Devine Baseball currently offers six pitching machines. Cages one, two and three have pitching mounds. Balls are provided. L-Screens are also available. 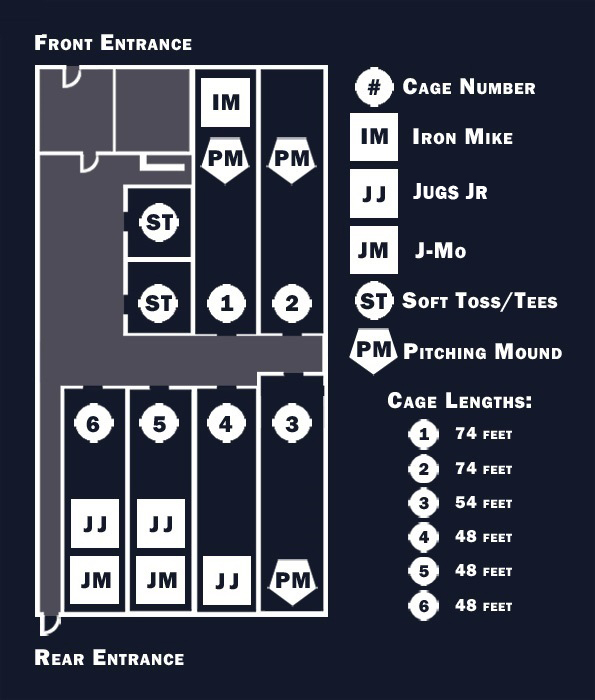 Please call in advance to reserve batting cages specific to your needs. Please use caution and maintain safety when inside the batting cage facility. Please keep a proper distance from cages when they are in use. © 2015 DEVINE BASEBALL LLC.